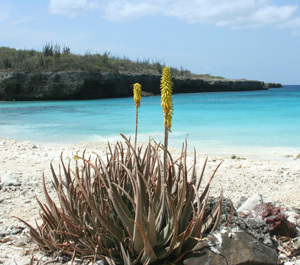 Aloe vera on the island of Bonaire in the southern Caribbean, where it was once cultivated and has now become naturalized. Most people recognize the word aloe in conjunction with the therapeutic, cosmetic, and medicinal properties of the leaf sap of Aloe vera. This is a commonly cultivated plant widely available almost anywhere plants are sold. Many people have a small plant growing in the kitchen window, close at hand in case of burns from cooking or other household tasks. Aloe vera has been in human cultivation for over 2000 years, and has likely been “improved” by selection of forms with greater therapeutic value throughout that period. Interestingly, what we call Aloe vera today is not definitely known as existing in nature, though similar plants are known from Oman on the Arabian Peninsula. Because of its useful properties, Aloe vera has been cultivated in areas of mild climate throughout the world. 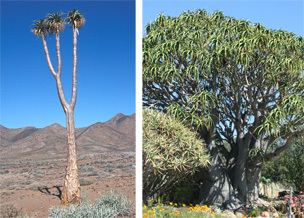 Left: Aloe pillansii at home in the desert of South Africa. Right: The south African Aloe barberae is the largest of the genus, here growing at Grigsby Cactus Gardens, a nursery in Vista, California. Both are probably a bit too large for the average Wisconsin windowsill. Aloes have been placed in various plant families; initially they were in the Liliaceae. Today taxonomists place them either in the Asphodelaceae (with asphodels and red hot pokers) or Aloaceae (with a few other related succulent genera). The genus Aloe is native to Africa, especially the drier areas of southern and eastern Africa and the neighboring island of Madagascar, and southern Arabia. The genus is large, with well over 400 named species, and new types are still being found in out-of-the-way places. Plants vary in size from massive, heavily branched trees over 60 ft tall to tiny ground-hugging plants barely an inch in diameter. The plants generally have highly succulent leaves, usually in a rosette pattern, though a few hold their leaves in a fan-like pattern, and several small species that live in grasslands have very slender, though still succulent, grass-like leaves. Left: Aloe harlana from Ethiopia shows the typical rosette pattern of growth of most aloes. Note the attractively marked leaves with toothed margins. Center: When young, the leaves of Aloe suprafoliata (from South Africa) lie in two stacked rows, but plants become rosettes as they mature. Right: The miniature Aloe calcairophila from Madagascar maintains its leaves in two rows. The tubular to bell-shaped flowers are produced in loose to tight, cylindrical, conical, or head-like clusters (racemes) on branched or unbranched slender stalks, and are predominantly various shades of pink to red, though orange and yellow colors are also common, and white and green are also known. Bicolor flowers are not uncommon. Left: The small hybrid Aloe ‘Freckles’ has a fairly typical Aloe inflorescence in the form of a raceme with tubular flowers. The shape and density of the raceme and color of the flowers vary with species. Center: Aloe maculata (the form called saponaria) from South Africa has either reddish or yellow flowers in a tight capitate (head-like) raceme. Right: White flowers of Aloe calcairophila. 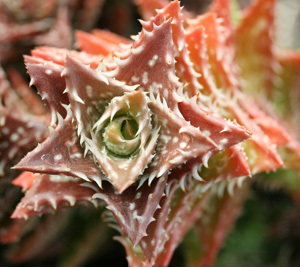 Aloe juvenna is a delightful, easy to grow miniature from Kenya with clustering columnar rosettes less than 2 across. Species such as this with leaf bumps, teeth, and interesting colors are used as parents in hybridization programs. Leaves are often attractive, variously colored in hues of green, red, pink, and lavender, and ornamented with stripes, spots, bumps, and teeth. 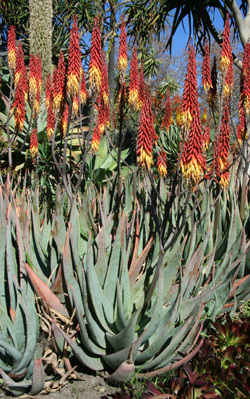 Medium to large aloes are common landscape plants in southern California. This is Aloe aculeata growing at the Huntington Botanic Garden near Pasadena. Note the bicolor flowers. Aloes are very popular with growers of cacti and succulents and other exotic houseplants. Medium to large species are usually adapted to full sun and require high light intensity to maintain healthy and typical growth. Such large species are best left to those who live in mild climates where they can be grown continuously in the ground; because of their interesting shapes and highly attractive flowers, they are popular landscaping plants in southern California and other relatively frost-free locations. In nature smaller Aloe species often grow partially shaded by rocks or other vegetation, and these types are well suited for growing under lower light conditions, though at least several hours of bright light daily are still needed for ideal growth, more colorful leaves, and more reliable flowering. No species will survive our winters so here in Wisconsin they must be grown as container plants. These are best kept outdoors with at least some full sun during the summer and moved to a bright location indoors during prolonged cool, cloudy, wet weather and during our frost and freeze period of the year. There are many types of small species and hybrids from which to choose; some can be happy growing slowly for years in a 4” pot, while others will eventually grow to fill an 18” container, with every size in between. Many species produce offsets and eventually will form an attractive clump; others stay solitary. Cuttings root readily. All of these species are small to dwarf in size, with individual stems no more than 4 in diameter. All will do well initially in a 3-4 pot, but all cluster with time and will need to be moved up to larger pots or divided. Left to right: Aloe brevifolia, A. humilis, A. florenceae. The first two are from South Africa; the third is from Madagascar. Aloes have been the subject of hybridizers for years, and some amazing, almost unbelievable hybrids are available through specialty succulent plant nurseries, though newer, more exotic (and rarer) hybrids can have a sizeable price tag (up to $40). There are many dozens (hundreds?) of named hybrids and they come in all sizes, from landscape specimens to tiny miniatures. For a good overview of Aloe hybrids see this article on Dave’s Garden. Previously it required many years to propagate selected hybrids by normal vegetative techniques. Today, desirable hybrids are quickly propagated in tissue culture labs. Aloe descoingsii (left) and A. haworthioides (left center) are popular, easy dwarfs from Madagascar that are frequently used in breeding programs. A. ‘Pepe’ (right center) is a first generation hybrid of the two. Aloe ‘Winter Sky’, with white snowflakes against a grey sky, is another A. descoingsii hybrid. 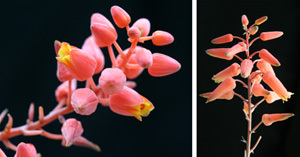 Flowers of Aloe descoingsii left) and one of its hybrids, Aloe ‘Winter Sky’ (right). Aloe ‘Medium Well Done’ (left) by Kelly Griffin and A. ‘DZ’ (center and right) by Karen Zimmerman show the seemingly impossible colors and textures being created by modern hybridizers. These hybrids have lengthy lineages and complex parentage. Aloes are best grown in a well-drained potting mix, in a pot with a drainage hole. 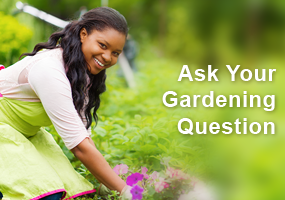 The roots should not be allowed to be continuously wet – allow the soil to dry between waterings. 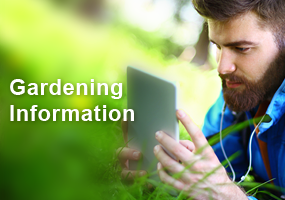 Most aloes are from summer rainfall areas and therefore are summer growers. 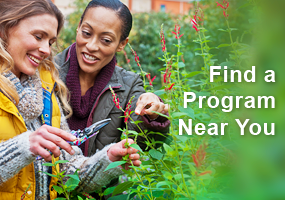 In Wisconsin, even the smaller types can be given full outdoor sun in the summer, and, if the soil is very well drained, can tolerate frequent rains, especially during the warmer months of summer. When the weather is cool and cloudy they are best kept on the dry side, including during the winter when they are less actively growing. Most aloes are very cold sensitive and should be protected from prolonged temperatures below 50°; certainly protect from frost. During their winter rest period smaller plants can be grown in a bright windowsill, though keep in mind they should not be allowed to suffer temperatures much below 55°F, so you may want to take them off the windowsill during those -30° nights. Aloe variegata has been a very popular houseplant for over 200 years. It was one of the first aloes to be taken back to Europe by early explorers returning from southern Africa. The plant on the left was purchased at Home Depot. The photo on the right was taken in habitat in South Africa. It needs a well drained soil and sparse watering in the winter, otherwise it is easy to grow. Small aloe species and hybrids often bloom when only a few years old. Different species will bloom at different times of the year, but many bloom in winter (January to March) providing a nice splash of color during a dull time of the year. Aloe plants are more likely to bloom if they get abundant light throughout the year, so be sure to provide them a bright location in winter. Given ideal conditions, some small species and hybrids bloom almost continuously for months on end, sending up new flower stalks when the old ones fade. Aloes can often be found in the mixed cactus and succulent offerings of the large chain stores. Many of these are generically labeled “Aloe species” or “Aloe hybrid”, or are misnamed, so be prepared for the “cute little puppy” to possibly grow into a Labrador retriever. There are many reputable mail-order cactus and succulent nurseries on the internet; one good starting place is the Cactus and Succulent Plant Mall which lists numerous U.S. nurseries. These are three true dwarves seen in their natural habitats in Madagascar. Aloe droseroides (top) and A. inexpectata (middle) grow in very restricted areas on the same hillside. Aloe parvula (bottom) growing amongst granite boulders. calcairophila (Madagascar) #dw, ?, ! droseroides (Madagascar) #dw, ?, ! inexpectata (Madagascar) #dw, ?, ! krapohliana ssp. dumoulinii (Namibia) #dw-sm, ? longistyla (South Africa) #sm, ? Great general information on Aloe plants. I really was looking for more information on how to divide an Aloe plant. I have found aloe to be one of the easiest house plants to care for. They tolerate my neglect like champs! I have always stayed with the more traditional varieties but I may need to look out for some of these smaller more colorful ones. Aloe is something I have never grown. As I lean into medicinal growing for 2019 I’ll be putting this into my houseplant mix. Thank you! Even though I’m repeating others–I didn’t realize there were so many types of aloes either. And the flowers vary to much as well. You can really see the ones with the red hot poker blossoms are in the same family. Aloes remind me of starfish. From this article I gather that probably the biggest concern is low temperatures; otherwise they sound easy to grow. Aloe aculeate, what a statement in the garden when they bloom and when in not in bloom. Adds so much texture. So sad we can’t grow it in Wis. The flowers on some of these aloes are very pretty. I didn’t know there were so many aloes either Marji. I don’t think I realized that there were so many types of aloes. Interesting read. I would like to add more to my comments. I do have several Aloe plants in my home and I always had one in my classroom. They are amazing plant to use not just for burns but for cuts and rashes as well. I would not want to live without an Aloe plant on my window sill.